When I created this blog nearly 8 months ago, I was living in Kansas and knee-deep in one of the bitterest winters the Mid-West had seen in years. At the time, my family and I were surviving on weekly soups and hearty meals to keep ourselves warm, so it seemed perfect to name my food blog SoupBowlRecipes! It was an obvious choice for someone who was freezing and didn’t have the foresight to consider that they would eventually move to one of the hottest states on the planet, where, for at least 6 months out of the year, the thought of making soup is unbearable. And now here we are in Texas, in mid-August, where the temperature for the past few weeks has been hovering around 100°F and shows no signs of breaking. So what’s a girl supposed to do? 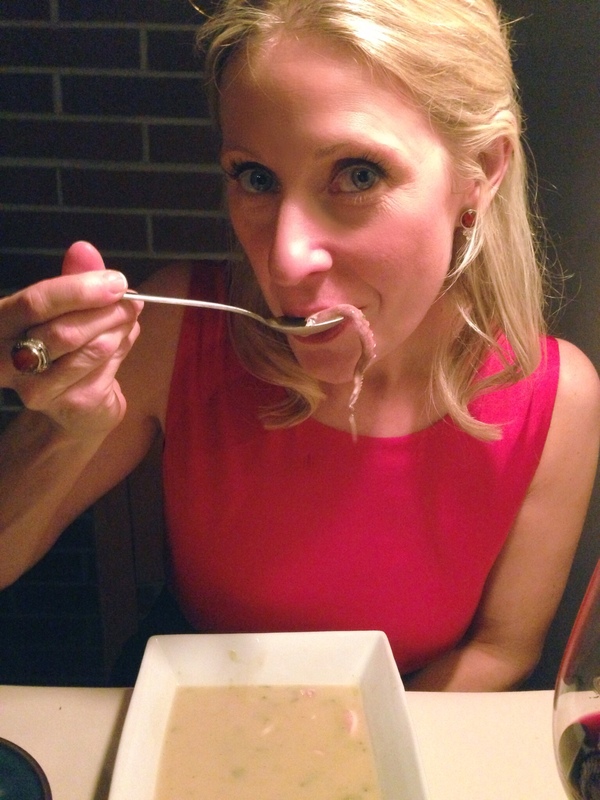 Well, what every good soup blogger does when life hands them lemons – make lemonade! 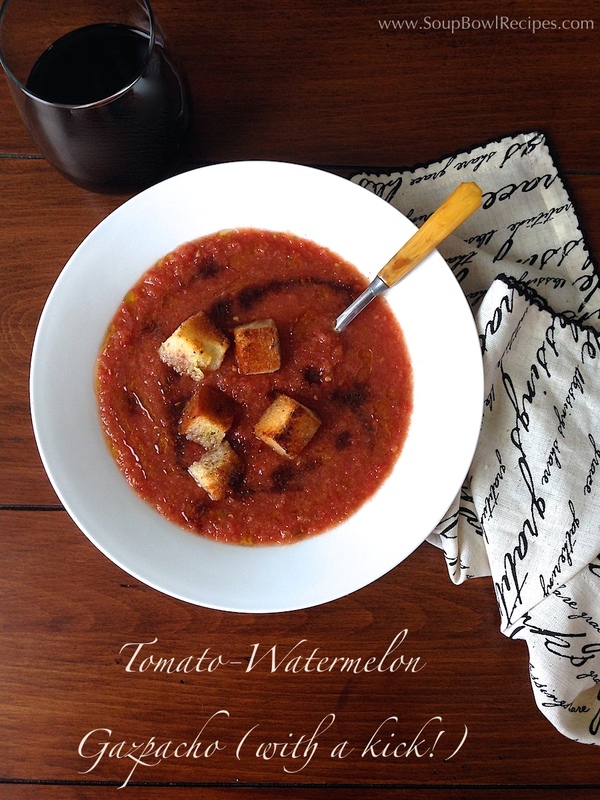 Or in this case, I’m taking my farmers’ market tomatoes and making a refreshing gazpacho! *I like my gazpacho a bit on the spicy side, so I usually add 1-2 Tbsp of Sriracha, however, if you’re not one for heat, start with 1 tsp, then add more if needed (or omit completely). Note: If you’re planning on making your gazpacho ahead of time and serving later, just know that it will get spicier the longer it sits in the refrigerator, so plan accordingly. I recommend being a little conservative with the hot sauce when you first make the gazpacho, then adding more as needed just before serving. 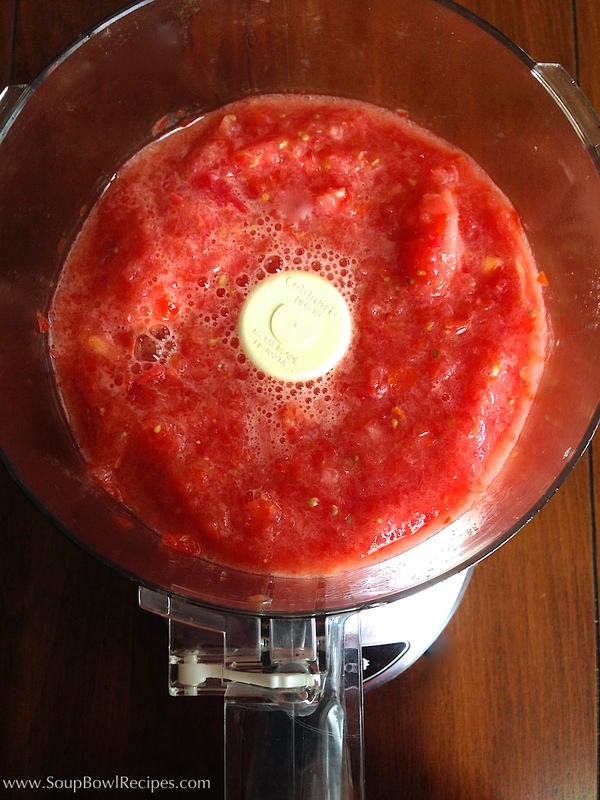 In a food processor or blender, purée tomatoes until mostly smooth with a few small chunks remaining. Transfer to a large, non-reactive bowl. 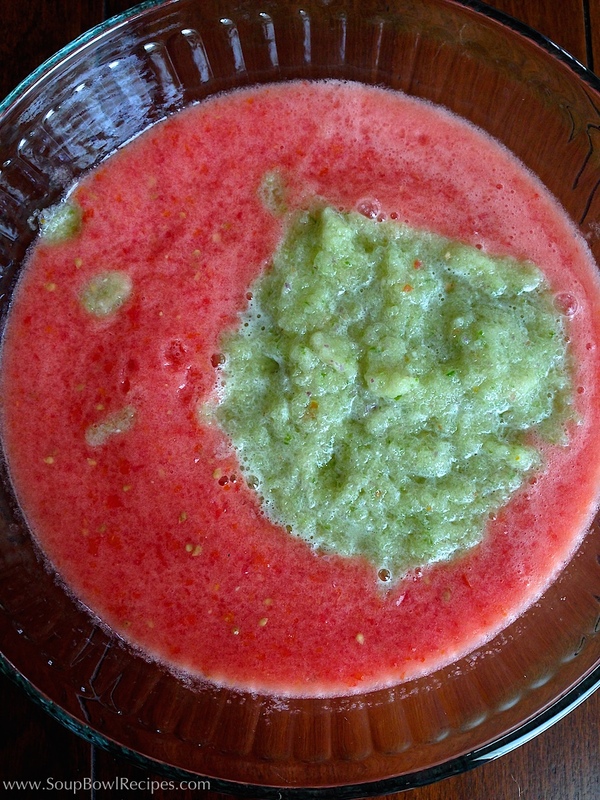 To the same food processor or blender, add cucumber, garlic, onion, jalapeño, and watermelon and purée until smooth. Transfer to the bowl with puréed tomatoes and stir to combine. Add sherry vinegar, oil, Worcestershire sauce, paprika, hot sauce, and salt & pepper, and stir to combine. Taste and add more seasonings as necessary. 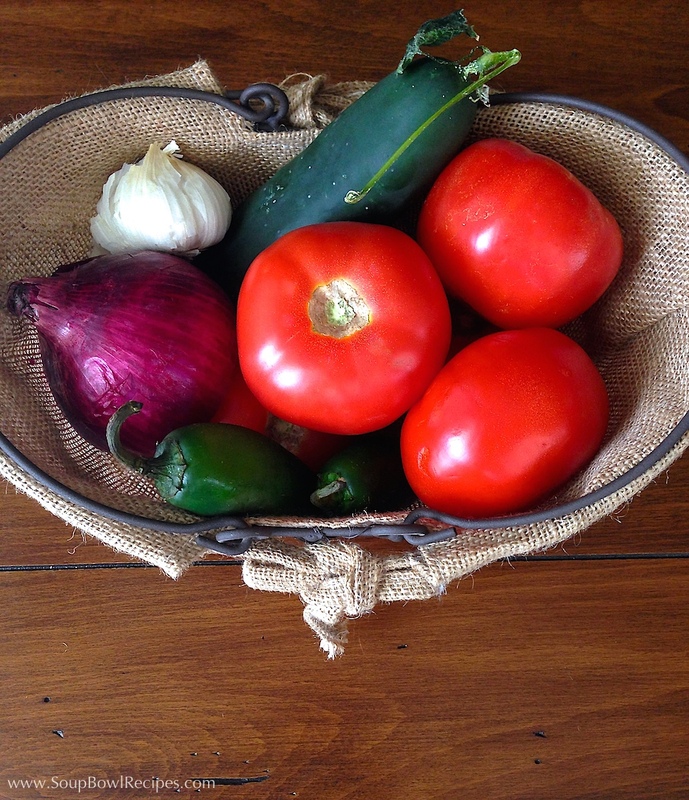 Gazpacho can be covered and refrigerated for up to 3 days. 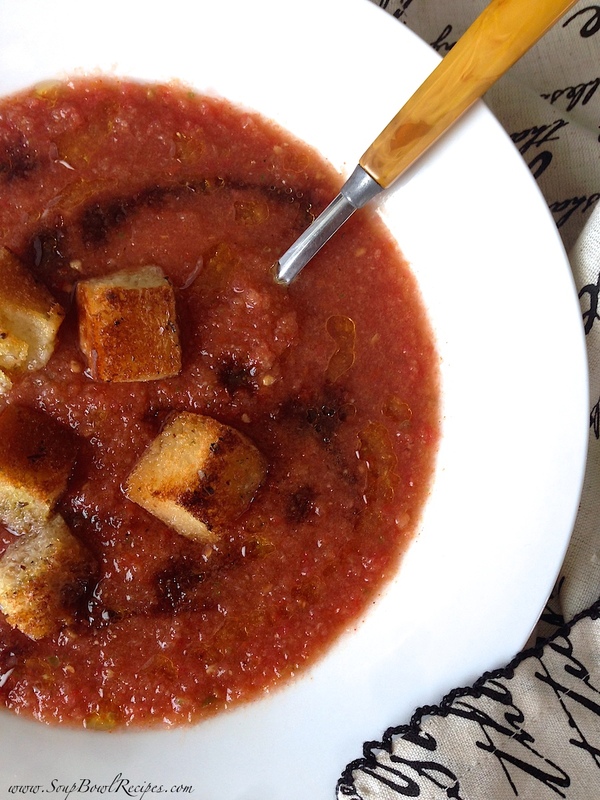 Ladle gazpacho into bowls, drizzle with good quality olive oil and balsamic vinegar, and top with 5-6 garlic croutons. Serve cold. Turn oven on to broil. In a medium bowl, combine bread cubes with all remaining ingredients and toss until bread is coated in oil and seasonings. Spread bread cubes in a single layer on a baking sheet and broil, turnning occasionally, until golden brown and crunchy, about 5 minutes. Allow to cool slightly before serving. 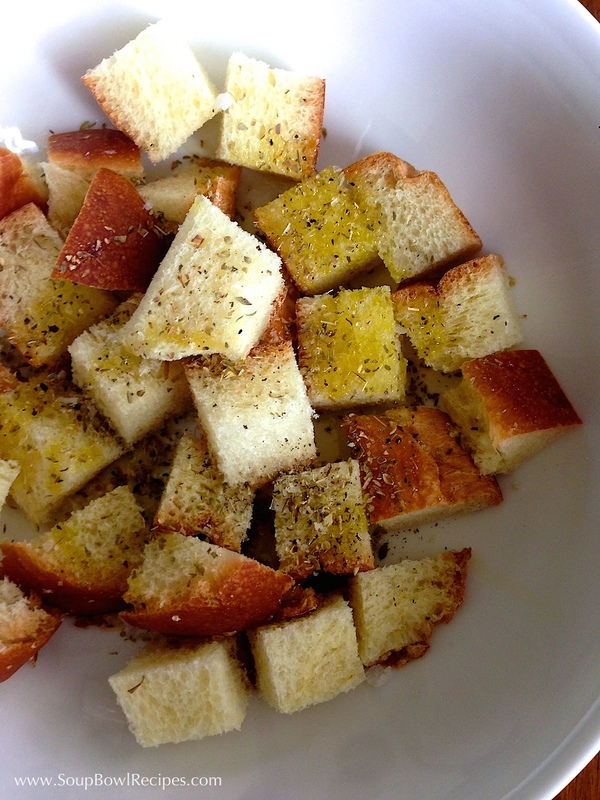 Croutons can be stored in an airtight container at room temperature for up to 3 days. Sidekick: Serve with a bold Pinot Noir, a dry sherry, or a chilled glass of Sauvignon Blanc.